You are in the presence of Salt Flats royalty today with this 1940 Ford Standard 2 Door Coupe, because it was the very racing machine that propelled infamous Jerry Helwig to his world record run. 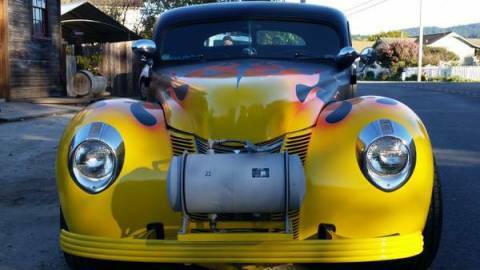 It features a highly modified 284 flathead 8-cylinder engine under the hood with a 3-speed manual transmission, and this beauty absolutely screams out on the open road. With ample documentation and all of the original equipment he used to make his legendary run, this one is an absolute steal at the current asking price. This isn't simply any 1940 Ford Standard. This one was personally owned by the legendary Salt Flats racer Gerald Jerry Helwig and set a class World Record in this vehicle many decades ago. In fact, this racer known simply as "The Coupe" was featured in many books, magazines, newspaper articles and advertisements throughout the years so race fans should know this vehicle well. Jerry was known as one of the worlds leading authorities on flathead engines. He lived and breathed to race this highly iconic vehicle every year. "The Coupe" includes all of the parts to bring it back to its Bonneville state once again (roll cage, racing harness, lightweight drive shaft and cogs for rear end). While the interior is in fairly rough condition, this gorgeous racer still produces incredible power when prompted and it appears to be in good mechanical condition. Honestly, this one likely belongs in a museum due to its incredible history, so it will be a tough call on whether or not to restore it. Overall, this 1940 Ford Standard Bonneville is one of the most sought after vehicles we have ever had here at Highway One , and it is only available due to Gerald Helwigs passing. The information presented for this vehicle is deemed reliable, but is not guaranteed as a basis of purchase. The Buyer should make a thorough, independent inspection and investigation of the vehicle prior to purchase.